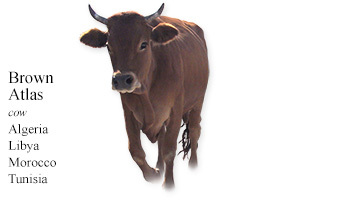 Brown Atlas is a general name for cattle that have been described as a shorthorned brachyceros type, but more commonly as an Iberian type, similar to the Libyan. The Brown Atlas evolved in the Maghreb region (historically known as the Barbary Coast) which encompasses the Atlas Mountains — a series of mountain ranges with assorted terrain, climates, flora, and fauna — and is spread over North Africa. The Maghreb contains the countries of Morocco, Algeria, and Tunisia; there are lots of canyons and ravines and Berber villages. Previously, it was thought that Brown Atlas cattle descended from a group of animals brought by Berber people from Mesopotamia during the second century BC. (Mesopotamia was a region of southwestern Asia, lying between the Tigris and Euphrates rivers, in what is now present-day Iraq.) It is now thought that these shorthorned cattle probably evolved much earlier from locally domesticated aurochs in the Sahara. Originally, there were many varieties of Maghreb mountain cattle, but interbreeding among these and other indigenous breeds led to a homogenization resulting in the general name of Brown Atlas. The purest remaining forms of the Brown Atlas are now found only in Morocco and also remote areas in the other two Maghreb countries (Algeria and Tunisia). Algeria claims to have the most stable population, but the Brown Atlas is on the decline. Currently, the focus of the dairy industry in Algeria is to use, and also crossbreed with local cattle, the Montbéliard and Brown Mountain cattle, plus the importation of Holsteins. Morocco is also importing large numbers of Holsteins. In Libya, Brown Atlas-type cattle are called ‘Libyan’ and are found in the east and the Misrata District in the northwest. Brown Atlas cattle are disease resistant and fare well in difficult climates, specifically arid zones with poor vegetation. The population is predominantly transhumant (seeking pastures between mountainous and lowland areas as seasons change). The Brown Atlas has been described as being a hardy dual purpose breed used for milk (low yield, short lactation time) and draught. The steers are docile. Low nutrition has been noted in these cattle as they are mainly grazed with some concentrates fed only during the dry season. Production is highly variable depending on their location and management system. My Daily Cow® Algeria, Libya, Morocco, and Tunisia and read about other Algerian, Libyan, Moroccan and Tunisian cattle breeds.